This one's coming with an official health warning, I lost two hours of Tuesday evening (I like to dedicate my Tuesdays to the bohemian pursuit of Domestic Sluttery experimentation), a significant portion of my tequila reserves and spent most of Wednesday in a slightly vegetative state thanks to the moreish deliciousness of this beguiling fella... there’s nothing quite so decadent as a Wednesday morning hangover. I've been desperate to try out the recipe for a while but as a diehard traditional Old Fashioned fan I wasn't quite sure what to expect. It’s one of those cocktails that, whilst superficially easy to construct, has been elevated to a bit of an art-form. I mean this drink gets its own three-minute guest appearance in Mad Men, so why would I suggest the blasphemy of taking it south of the border and pumping it full of tequila and agave? The answer is because the result is a slow-sipping, smile inducing syrupy indulgent treat. So leave all your preconceptions of summery margaritas and gaudy tequila sunrises, this is going to be the adult drink that sees me through the autumn till I can break out the port and brandy for Christmas. Incidentally, get some huge ice cubes for short drinks like this that you want to keep cool and last. They look amazing and won't dilute your drink. Add the tequila and dry shake for a few seconds (if you drop the ice in first it will cause your agave to turn into fudge), then add some ice and shake again. 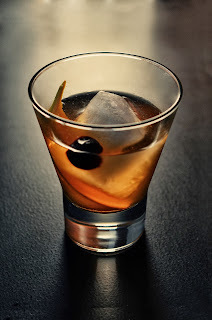 Strain into an ice-filled glass with one of the cherries, peel another bit of orange zest, squeeze it over the top of the drink and let it sink to the side of the glass.